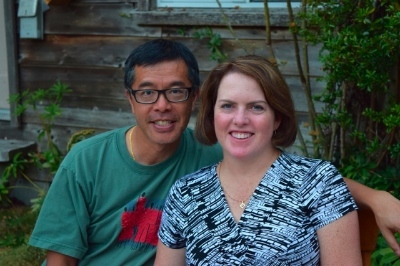 Barry and Joan Jung have overcome their natural inhibitions to befriend their neighbours along the Cambie Corridor. Barry and Joan Jung have lived the past 14 years on Cambie Street between Queen Elizabeth Park and the Oakridge Mall. They kindly agreed to share a bit of their journey into community with their neighbours, in the face of rapid and drastic redevelopment along the Cambie Corridor. This article is re-posted by permission from a December post on the City Gate Leadership Forum blog. 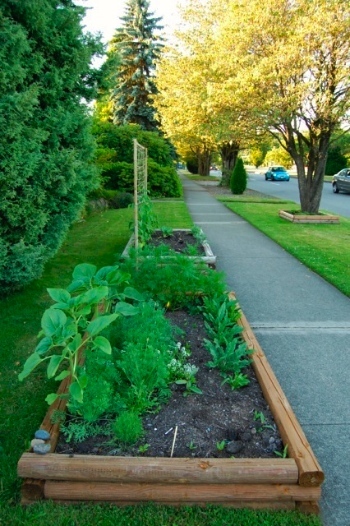 A couple of years ago, you planted a small vegetable garden in your front yard, next to the sidewalk. Then you put a sign in it: “We grow, you pick.” What led you to do that? Three years ago, we were inspired to get to know our neighbours by a couple at church who hosted a get-together at their house before Christmas. We did the same thing and mail-slotted invitations to 24 homes in our block. We were disappointed that only two people (a couple from across our back lane) showed up. The Jungs connected with their neighbours over the garden in front of their house. As we looked for another way to reach out to our neighbours, we were further inspired by a Ted Talk on Edible Landscapes to expand our vegetable garden to the front of our house. We connected almost immediately to neighbours and general walk-by traffic. We hadn’t realized before how much foot traffic there was in front of our house.​ Even sunflowers helped us meet a child in our neighbourhood, as he would stop each morning to say “hello” to Mr. Sunflower as they walked by. What else are you doing with your neighbours to build a sense of community? We continue to expand our garden in the front yard and to hold our Christmas event – in the second year we hosted 13 neighbours, many of whom stayed past our 9:30 curfew until almost midnight. In May, we organized a Breakfast on the Boulevard to cheer on runners in the BMO Marathon, which goes along Cambie. It was a dreary, rainy day but eight neighbours and an American tourist cheering her daughter came. 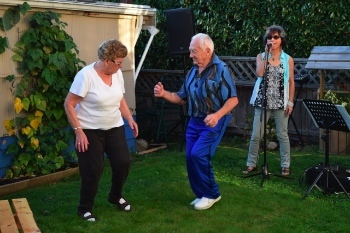 Barry and Joan Jung hosted a backyard barbecue with live music and an open mic, performed/organized by one of their talented neighbours. This summer, we hosted a backyard barbecue with live music and an open mic, performed/organized by one of our talented neighbours. We have invited some to our annual ice-skating party as well.​ We go for evening walks in the summer and make it a point to say “hello” to each person we pass. We say “yes” to invitations into our neighbours’ homes. Christian community developers in Latin America have a saying: “We make our trails as we walk them.” How are each of you being stretched in your spirit and personality as you journey deeper into the life of your neighbourhood? Are you seeing Jesus in a new light? We’re generally very reserved and somewhat subdued. We’ve been feeling led to go and knock on doors to introduce ourselves ​to our neighbours, inviting them to our parties. We make a point of waving or saying hi when neighbours drive down the lane. This is so uncharacteristic of our personalities. Indifference, lack of connection and fear of rejection has been a reason why we didn’t reach out in the past. Also, rather than viewing people as projects, we just view them as people who we want to have a genuine relationship with to share knowledge, opinions and views and common interests. We are hoping that relationships will grow so that we will share more personal details of each others lives. It’s so freeing not to have pressure to proselytize. We feel called to love our neighbours in practical and courteous ways, as we are confident that Jesus will already be in that. God is already at work in our neighbourhood – we just open our eyes and see what he’s doing and be available to our neighbours. What does the good news look like for your neighbours? What aspects of the gospel could touch their greatest felt needs? Some are isolated and lonely, so we think that perhaps just being available to listen and acknowledge their presence is good news. ​Many in our neighbourhood are feeling displaced or are watching the houses come down around them to make way for large condo buildings. Change is hard if you’re not ready for it. Many of them have appreciated just getting to know other during this time of transition on Cambie Street. There’s no love unless there is relationship – we can’t love our neighbours unless we know their names at the very least. As we get to know their names and encourage them to know each other’s name, we hope that we all will sense and form community in our neighbourhood. Where do you draw inspiration from? Are there people, books or other resources helping you to find your way? We have been blessed in our small efforts to build community and have realized that we long for this in our neighbourhood. Our neighbours likely have a similar desire, though they may not yet be fully conscious of it. As they respond in friendship with us, we are inspired to continue our efforts. We are encouraged by books such as The Art of Neighbouring and The New Parish, by the Planted Network and by community leaders who live in ‘intentional community’ homes around town. We’ve participated in some of their events and have been inspired by their intentional and thoughtful extension of community. We meet about four times a year with others from the church community-at-large who are intentionally engaged in their neighbourhoods. We meet to encourage each other and hear what is happening in other places. How has your congregation been a support to you? Are some of your experiments now spilling over into the life of your church or other churches in your neighbourhood? Our church leadership [at Granville Chapel] has been supportive. Other community leaders such as Karen Reed and you have been supportive. Community meals and similar initiatives at our church were inspired by your visits and sermon. We are now getting involved in local Neighbourhood Houses to mentor newcomers and connect with community-minded individuals at potluck events. Our associate pastor will be moving in January to one of the poorest neighbourhoods in California to start a neighbourhood church – yes, it’s spilling over.